2017 was the first time we went abroad as a family. In fact it was the first time me and the Hubby has been abroad in the then 11 years we had been together. We headed to Crete one of the many Greek islands, with our 2 very excited children and my Mother and Father in law. 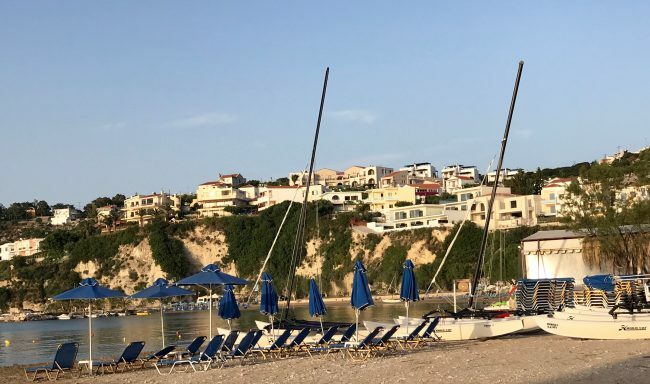 We chose the tiny little coast town of Almyrida and the most fabulous private villa up on the hill side about a 5 minute drive out of the town itself. We hired 2 cars that we collected at the airport nice and easily, it was about a 45 minute drive along to the coast from the airport to our villa. The drive gave us time to take in the beautiful island. Our villa was fabulous, set up the hill with views over the valley, across the town and out towards the sea. 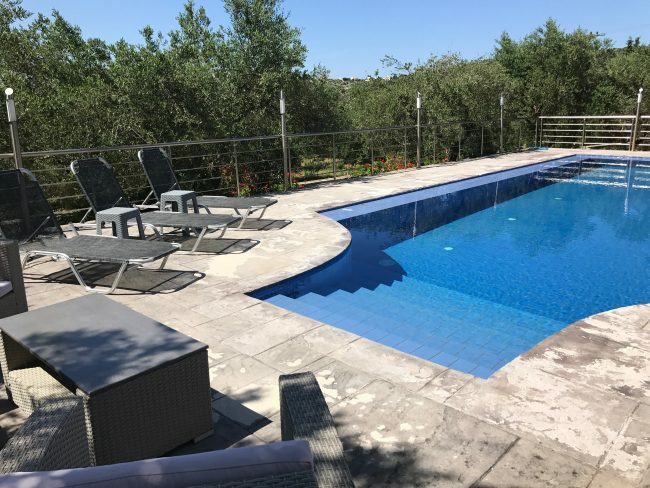 The villa also had it’s own private pool, set in a olive grow. The villa had 3 bedrooms, 2 double and a twin each with ensuite bathrooms on the ground floor. Then upstairs there was an open plan kitchen, dinning and living room, with doors out on to the wrap around balcony. The balcony became home to breakfast, board game in the evenings and many glasses of wine of the adults. The beach was lovely, sat right in Souda Bay. We spent a couple of lovely days on the beach. We hired lounger chairs from the local hotel at €3 each, but it was also perfect because it mean that the bar staff from the hotel came down onto the beach taking orders for food and drinks. Although as a family we had been on UK coastal holidays, being able to spend a whole day on the beach was lovely. We made sand castles, played with the beach ball and swam. We ordered food and drink from the hotel bar, which was all reasonably priced. For those couple of days of family fun making memories was worth every penny that the holiday cost us. Even now almost a year later we are talking about the holiday and the child are asking about when we can return to Crete. Greek food is some of the best in the world. Freshly made salads that are just out of this world, fresh fish dishes are very popular, things like moussaka, stifado, souvlaki are all popular. They also cater wonderfully for the children. The hubby tried the very popular lamb and goat meals, while I stuck to the fresh fish and salads. Oh I also loved the fried cheese, stuffed vine leaves, that we shared for starters most evening. Every time you go into a restaurant for a meal, they bring you ice cold water to drink while you choose your meals, they when they bring you your bill they bring out a small dessert, or bite size piece of cake. The island of Crete is just beautiful, steeped in history. 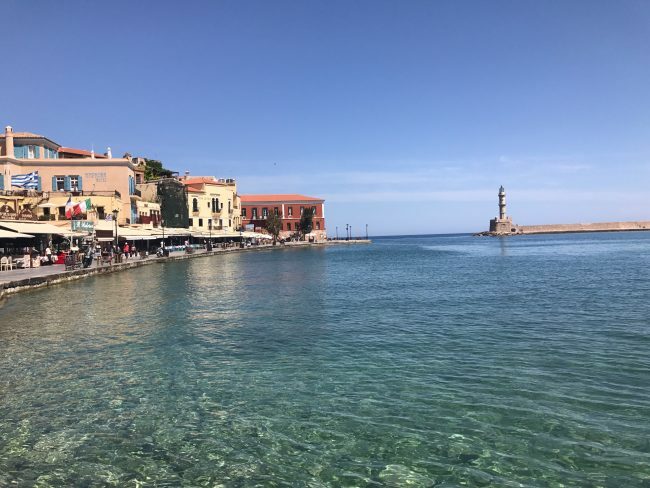 We visited Chania and Rethymnon both old Venetian harbour towns. We wondered around, popping in and out of the shops and beautiful cafes. If you love seafood you must pop to Rethymnon as the restaurants around the harbour have the most amazing selection of fresh sea food. Although we didn’t you can take a boot trip out to sea from the harbours which we plan to do when we next visit the island. Even though Almayda is small town, they have everything we wanted. A couple of small super markets, a bakery that sold the tastiest cakes, an ice cream shop, only a hand full of shops and then a nice selection of restaurants and taverns. We loved our week in Crete, the Cretans are some of the friendliest people you could wish to meet. All so helpful in shops, brilliant with the children and in the restaurants more than happy to explain what the food is and what it contains. We are going to go back but next time with think we will look at an all inclusive holiday. We have found some great ones here https://www.holidaygems.co.uk/all-inclusive-holidays We made memories that will last a lifetime and cannot wait to make some more during our next adventure. Have you ever visited Crete? What did you think to the island?